With every gathering of thousands, every time we bring people together in celebration of their goals achieved, we plan. We plan race course signage, potty stops, water stations, post-race refueling. We plan finish line set-up, participant parking, awards and entertainment. Of all the things we plan, one of the most important is likely never noticed – we plan in case of emergencies. The safety of runners, volunteers and spectators is of utmost priority as we plan all Hartford Marathon Foundation events. Our post-Boston Marathon reality has heightened awareness that even our beloved race moments can be vulnerable. We have strong, long-standing relationship with Hartford Police Department as well as with the City of Hartford, supporting communities of East Hartford, West Hartford and South Windsor, Hartford Fire Department, emergency services and medical response teams from Hartford Hospital. All of this collaborative effort is integral to the successful implementation of safety measures. We have great admiration and appreciation for our incredible partners for all they do to keep us safe – on race day, and every day! 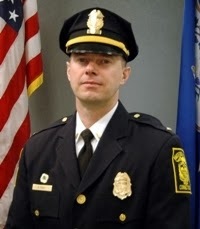 Please meet Lieutenant Brian Foley of the Hartford Police Department. A longtime runner and HMF supporter who is part of the security team for the ING Hartford Marathon. What is being done to address runner safety? Although we are unable to detail all of the specific security measures for obvious reasons, we want to assure runners, spectators and the community that extensive plans are in place to create the safest possible event. We are asking spectators and participants to heed instructions to be aware of their surroundings, just as we hope they do everywhere in large group settings. Please remember the “see something, say something” mantra. There will be ample police support on site, direct an officer to anything that raises question. What else can runners do? We’re encouraging runners to use the free bag check service available and asking that everyone be mindful about leaving personal items at home or in their vehicles to avoid extra bags and belongings.